Donald John Trump Sr. was born June 14, 1946, in Queens, New York. He is the son of real estate developer Frederick Christ “Fred” Trump and Mary Anne McLeod Trump. He was one of five children. Trump was raised in Queens and attended The Kew-Forrest School in Forrest Hill, Queens. After he experienced some behavioral difficulties at the school, Trump’s parents elected to move him to New York Military Academy in Corwall-on-Hudson, N.Y. There, Trump was an academic honors student and a varsity athlete in football, soccer and baseball. After graduating from NYMA, Trump attended New York’s Fordham University for two years. He them transferred to the Wharton School at the University of Pennsylvania to attend what was, at the time, one of the few real estate academic programs in the country. He graduated with a bachelor of science in economics in 1968. After graduation, Trump joined his father’s company and launched a generally successful professional life as a real estate developer and owner of several gambling properties, although his career was marred by four bankruptcy filings for his businesses. In addition to his real estate dealings, Trump has profited significantly from the branding and licensing of the Trump name as well as owning the Miss Universe Organization, which produces annually the Miss Universe, Miss USA and Miss Teen USA beauty pageants. He also has established a significant media presence, most notably as executive producer and host of the NBC reality contest program The Apprentice. Trump has been married three times and divorced twice. He married Ivana Zelníčková in 1977. Together they had three children: Donald Jr., Ivanka and Eric. They were divorced in 1992. Trump married his mistress, Marla Maples, in 1993. Together they had one child, Tiffany. He and Maples were divorced in 1999. Trump was wed to Slovenian native Melania Knauss in 2005, and together they have one child, Barron William. Trump has also been involved in a number of questionable ethical situations, as well as legal battles. Trump also denied that he had ever filed for bankruptcy during the same debate when an opponent brought up the four times his companies had filed for bankruptcy,21 three involving casinos and a fourth time a hotel in New York City.22 Trump appeared to be trying to distinguish between filing for personal bankruptcy, which he has never done, and business bankruptcies. Perhaps most troubling are Trump’s alleged ties to organized crime. He was a developer of hotels and casinos in New York City and Atlantic City, requiring significant dealings with a construction industry in both locales that was firmly under the control of the mafia, and numerous Trump properties were built by firms run by organized crime figures.23 An unauthorized biography of Trump from the early 1990s details several alleged connections between Trump and organized crime, including a meeting between him and Anthony Salerno, head of the Genovese crime family, after he obtained a gambling license in Atlantic City.24 Trump has consistently denied all allegations. The issue most associated with Trump, that he helped bring to national attention, is the “birther” movement, which seeks to demonstrate that President Barack Obama is not a natural-born citizen of the United States.27 In the early years of Obama’s presidency, Trump became a leading figure in the “birther” movement, appearing on TV and in other media regularly questioning the validity of the president’s citizenship and of his publicly available birth certificate. Trump is a skilled communicator with a distinct style. He is frank and blunt, and frequently self-promoting. His extensive experience as a media entity, first as a businessman and later as a reality TV star and frequent political commentator and interview guest, make him roughly as experienced as many politicians in terms of communication skills and handling the media. Trump has, in the past several years, spoken regularly to conservative and Republican conferences, such as the Conservative Political Action Conference. He typically seems to connect well to the crowd he’s addressing. His communication skills may far exceed his political skills, manners, and ability to build support for his candidacy, however. His support for the “birther” movement, a long history of controversial comments (including recently saying of a female candidate that she wasn’t attractive enough to be elected28), and engaging in an ongoing feud with prominent conservative media personalities and outlets all suggest a severe lack of political acumen and an inability to expand his support beyond those drawn to his celebrity and business background. Following the first week of 2016 and a decline of nearly 1,000 points in the Dow Jones Industrial Average of stock prices, Trump said, “Wall Street has caused tremendous problems for us. We’re going to tax Wall Street.”34 It was not clear what, if any, new taxes he might have been referring to. He has generally opposed transitioning the U.S. income tax system to a flat tax, feeling that this system benefits the wealthy far too much,37 and has proposed in the past raising taxes on carried interest. He has also been critical of the sequestration budget cuts for only having slowed the growth in federal spending, adding “it’s not really a cut”42 and calling for more spending cuts to balance the budget. His tax proposal, unveiled in late September 2015, is supposedly revenue-neutral and would not add to the deficit, although that depends on an assumption of 6 percent economic growth,43 which few consider to be realistic. He has announced that he opposes an increase in the minimum wage, arguing it would hurt U.S. economic competitiveness,47 and said that men and women should be paid the same for doing the same job but noted that it’s “very difficult to say what is the same job,”48 suggesting some skepticism about further legislation on the matter (it’s already illegal to pay men and women different wages for doing the same job). He has called for more drilling of oil in the U.S.54 and expressed his support for hydraulic fracturing, or fracking, to develop American oil and natural gas.55 He has supported construction of the Keystone XL pipeline,56 although in late October 2015 he suggested the U.S. should get a “better deal” from the company building the pipeline in exchange for allowing it to be built, saying that “Maybe we should get 10 per cent, 15 per cent, maybe 20 per cent as that oil flows,”57 apparently meaning the U.S. should impose a tariff on the oil that transits the pipeline. In January 2016, Trump said he favored allowing Medicare to negotiate prices for prescription drugs,68 a longtime priority of Democrats. Most free-market analysts believe this action would effectively establish price controls and diminish research and development for new drugs. He has vowed to deport all illegal aliens currently in the U.S,88 which he predicts will take less than two years with “really good management,”89 and also said he will prevent remittances being made by illegals to their home countries.90 Most recently he has suggested that “birthright citizenship,” which grants U.S. citizenship to the children of illegal immigrants who are born in the U.S., should be ended,91 something most believe would require a constitutional amendment. He has criticized the Obama administration’s handling of Russia, saying that Vladimir Putin has “eaten Obama’s lunch, therefore our lunch, for a long period of time.”108 He contends that Putin is “playing [Obama] like nobody’s ever played him before,” calling it “quite embarrassing to watch it unfold.”109 He asserts “if Russia respected us they wouldn’t be doing what they’re doing.”110 As to what he would do as president in dealing with Putin, he has simply said he would “get along” with him111 and when asked said “I wouldn’t care” whether Ukraine was invited to join NATO. Trump said that as president he would sign an executive order mandating the death penalty in cases where police officers have been murdered,169 which would seem to overstep the authority of the presidency and violate the role states have in seeking penalties for non-federal crimes. In other troubling comments on the First Amendment, Trump vowed to “open up our libel laws so when [newspapers] write purposely negative and horrible and false articles, we can sue them and win lots of money,”176 suggesting he would use libel laws to silence or chill the speech of his media critics. He also favored “a slightly longer waiting period to purchase a gun,”191 and it’s unclear if he has shifted his position on this issue. He said he would consider a ban on gun purchases by those on government terrorist watch lists,192 something opposed by most gun-rights advocates because the lists are often inaccurate and violate due-process rights. His decision to renege on a commitment to pay for the medical treatment of his nephew’s son, born with cerebral palsy, as part of a dispute regarding his father’s will218 is likely to be used against him on the campaign trail. Trump lacks the discipline most candidates have in terms of avoiding controversial statements, such as his comments regarding Mexican illegal immigrants being “rapists.” On the one hand his admirers are drawn to his unvarnished speaking style but it also can repel many voters, particularly those who count themselves as members of groups targeted by Trump’s incendiary comments. 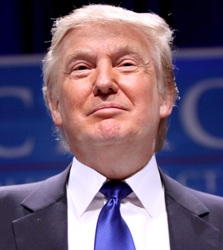 One of the key themes of Trump’s campaign has been opposition to illegal immigration and protecting U.S. workers from foreign competitors, but his own use of illegal immigrants in the construction of the Trump Tower224 and hiring foreign employees to come to the U.S. under a visa program for temporary workers225 may be used against him. Trump has been consistently vague on a large number of policy topics – declining to offer specific proposals or ideas, using euphemistic language that has little real meaning, or getting key details wrong. For example, he has said allowing Medicare to directly negotiate prescription drug prices would save $300 billion per year, when that is more than the entire country spends on drugs each year.226 He also said he would send “cease and desist” letters to China and Mexico to tell them to stop “ripping off” the U.S., even though that phrase has no real meaning.227 To date, his unwillingness or inability to delve into policy details has not been a problem for him, but at some point voters may expect more information or a better grasp of policy details.